Thank you for stopping by my official website. 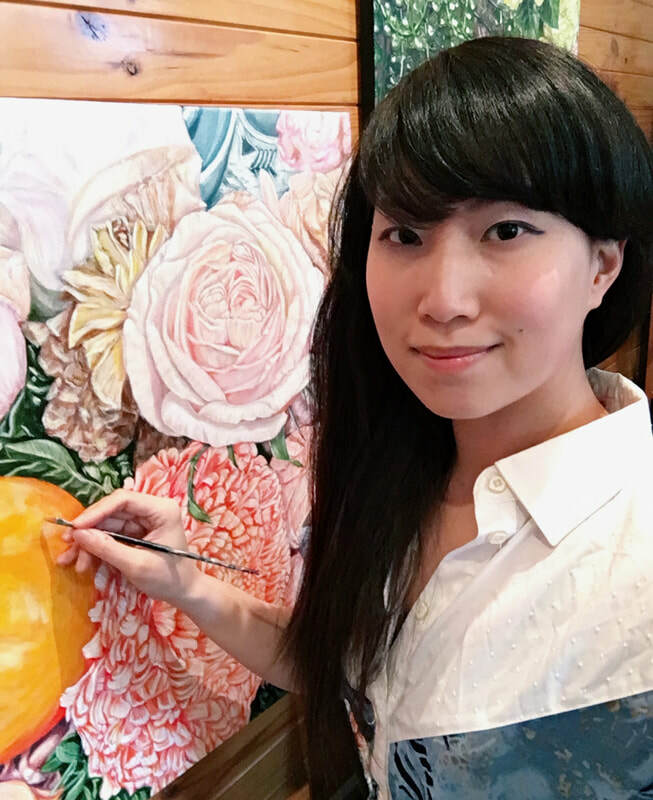 I am HSIN LIN , Full Time Artist based in Melbourne Australia ,obsessed with the beauty of flowers . I believe there's no coincidence in this big wide world , every little thing is meant to be . Welcome to have a look of my gallery if you love what I do ,give my social media a follow for my latest art, or even find your favorite artwork of mine to accompany your beautiful life journey . Hope you enjoy the colourful world of my floral painting as much as I do too. ​-Art can be relatable, reachable and enjoyable. We loved all your little notes and letters, and the artwork itself is so beautiful and special. Thank you for sharing this beautiful piece of yourself with me. I'm really happy and honored to own it. Thank you again, I will cherish this artwork!! xoxoxoxo"
​Christina K, Collator , Nsw ,Australia . I just fell in love with your painting straight away. I read it and love your story of the artwork as well! I can totally relate to your story of the painting. Also the healing and protection idea! It's going to be in my piano room where I teach." When your painting arrived it made my day. Weeks, No, actually month. :D And what a lovely packaging! Thank you so much!!!!!! Walking by I thought about every time "ooh, what a nice painting! What? That's mine? Awesome!" and couldn't believe I actually like it more every time I see it. It found a place in the bedroom for now and I get to see it a lot - not a bad sight to wake up to every morning! Summer arrived here in the meantime and I've been to places seeing some real Bougainvillea.Took pictures. Like yours better." Thank you so so so much for the beautiful Cadbury 1/50 limited edition print. I'm so honored and humbled. I cried when I read the card and your beautiful words. The original painting is absolutely stunning too. I can't wait to frame it." I have the Cadbury the cat hung up on my wall already. It feels like I really have a cat with me which brings me so much joy." Sean L, Collector, California, USA. I received the painting safely this morning and it's beautiful, we will treasure it. I saw the post card while I was walking through the ANU School of Art the other day and loved it. I checked out the website to look at your paintings and noticed it was for sale. We have a pair of cats, Gus and Arthur, and they will be jealous that they aren't up on the wall. Your artwork has gone to a good home!" I just wanted to let you know that your parcel has arrived safely.Thank you so, so much for this amazing artwork , I am so in love with it! Thank you also for that beautiful card, letter & information about your beautiful art! Everything is do exquisite that you paint . I look forward to buying some more of your stunning art in the future." Lindy J , Collator , Adelaide ,Australia . This paintings of yours reminds me home . I can’t wait to see the artwork! I’ll send you a photo from Stockholm once I have it on my wall too! Thank you very much!" Dave ,Collector ,Stockholm , Sweden. I loved the words you wrote under the painting in the description, the flower reminds me the person I love." Alisha, Collector, Melbourne . I received your beautiful original artwork and couldn't be more happy. Thank you. Your work came to me quickly, and it was so carefully wrapped it arrived in perfect condition. I only buy art occasionally and when I fall in love with a piece. I will display it prominently and proudly. I love it." I look forward to receiving your great work, that one is my favorite. It's gonna be hang up in my shop very soon." The artwork will be gifted to my partner for our anniversary. I'm sure she is going to love it. Thank you ." ​Charlie N, Collector, Melbourne, Victoria. Artwork arrived safe and sound today and I lovvvvvvve it! I love your passion and amazing positive energy . I love that print because I also love cats. My birthday is on 12th, hence the reason why I have the Edition12 of the print. Thank you also for the beautiful card. I have my eye on a few artwork of yours which I love. " Viktoria N, Collector, Sydney, NSW. GOT A FEW FAVORITE PIECES IN YOUR MIND TOO? Copyright © HSIN LIN 2019. See Terms and condition here.